New Brewery restaurant in Hradec Králové, East Bohemia. The brewery building faces a wide open courtyard just between the church end of Hradec Králové’s main square and the city walls. 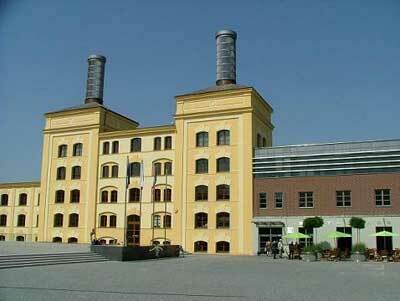 The brewery complex has been recently renovated. The original buildings now sport a fresh new coat of buttercup yellow plaster, the courtyard is landscaped and cobblestoned, and the new additions add modern flashes of stainless steel, glass and red brick. The restaurant is over to the right hand side of the courtyard if you enter from the direction of the square. In summer its full-height sliding glass windows will be open and there are likely to be tables scattered around outdoors under the shade of potted trees and lime green sunshades. Inside the restaurant is sleek and modern, with polished wood, dark tiles and muted green walls and bright orange upholstery. There’s probably about enough space for eighty diners in the main part of the restaurant and there seems to be some kind of function room off to the rear, so you’re always likely to be able to find a seat. As you might expect from a newly opened restaurant in a high profile and recently renovated complex, the new brewery is one of the more expensive places to eat out in Hradec. There are still however a few bargains on the menu. I liked the look of the Plzenský goulasch for 89Kč, but eventually chose the ‘fitness salad’. Doesn’t sound especially tasty though, does it? It consisted of several decent-sized pieces of chicken fillet resting on a mound of lettuce, cucumber and tomato. There were some garnishy bits and pieces, and a gentle vinegar dressing on the lettuce, but it was basically a warm chicken salad, and went for 115Kč, which I thought was reasonably good value for a healthy meal in the flashiest new restaurant in town. I’d eat there again but probably wouldn’t go back for the coffee. I tried it twice and both times it was too hot, too weak and at 31Kč, too expensive. U Knihomola does it much better for 23.